The canvas body enclosure field kit consists of a new top and side curtains. These parts were installed without alteration of the vehicle. In the above picture the “door” is unzipped and open for “easy” access. This WW2 jeep is parked in the snow, awaiting the arrival of its crew. This is actually a composite picture that I created from an original illustration (seen below) from the installation manual, a background winter scene and editing in an open door with interior. The top is installed in the same manner as the old one. The factory installed curtain fasteners are corerctly located for use with curtains supplied in the WW2 kit. 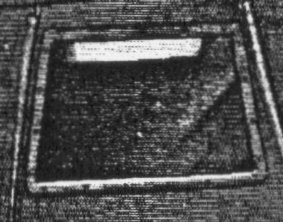 Detail of the front zipper door. Detail of the rear side curtain window. The windows were made of a celluloid material( a sort of plastic-like material). The “circles” in the frame are actually little bolts that hold the frame together. The frame holds the celluloid to the canvas fabric. No tools were required for assembly. For information check out Winter and the Willys MB/Ford GPW. 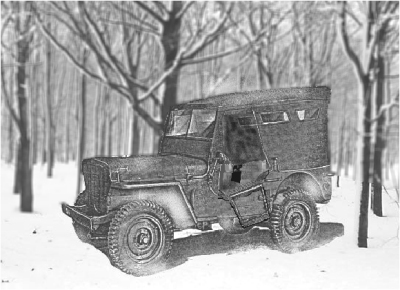 Description: A book that includes the gear issued by the US Army to winterized the WW2 jeep. Synopsis: The 84 page book contains the instruction manual for installing the Winterization Kits that were issued during WW2. Frankly, when I started more than 30 years ago in this hobby I didn’t even know WW2 jeeps could have had a heater. 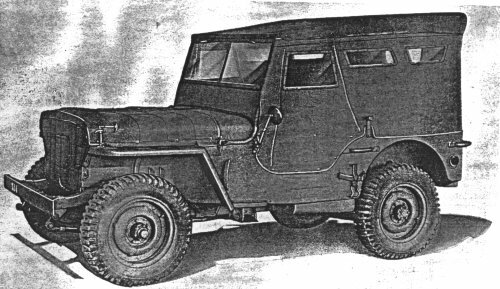 There is information here about the slave kit…this allowed one jeep to be used as a starter vehicle for other vehicles that were too frozen to start on their own.